Oh I am a very bad blogger. Sorry!! But I am here today because it is time to join another challenge at Raisin Boat. It is Challenge #33 and the theme is Moms and Dads. Now I know you want to make a card for you Mom for Mother's Day and your Dad for Father's Day. Both of my parents are gone so I made Mother's Day cards for my daughter in laws. See there are many ways to join the challenge. You could win a free set from Raisin Boat. You could make a scrapbook page, an art journal page, or both, because you can enter as often as you like. Use any set you have (you don't have to limit your entry to Raisin Boat stamps), but if you DO use a Raisin Boat stamp set, it will count as two entries. That gives you twice the chance to win a FREE stamp set of your choice! Remember, "You can enter as often as you like." You can either buy OR rent Raisin Boat sets -- no guilt in using a set for just one project, such as this challenge. They have an amazing collection of stamps and many that can be used for this theme. Here is the cards I created for my daughter in laws. I used Raisin Boat sets Springtime Love and Formal Phrases. These are two sets I do love. And here is the video on how I created this card. If you have any questions about Raisin Boat or the challenge please ask. And be sure to see all of the inspiration at the challenge and in the Idea Gallery. So beautiful! LOVING the wreath!!!! Cute! And what a great idea! Loving the little birds on top....nice touch!!! 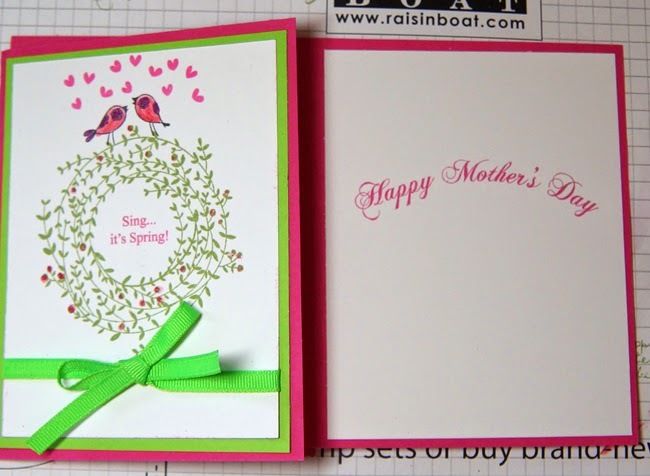 Beautiful card for any mother Linda love the stamps you have used a superb make. You say you are bad at Facebook, I practically live on there…I am bad at Instagram, Youtube and my Tracy's Treasures FB page. As for planning out my art journal pages…that is probably why I don't get as much done as you as it takes me longer to plan than to actually do the pages, lol. Thanks for visiting me at my blog. As for copying my Art page…what did you mean by that?